Just a quick post before I head off to work. 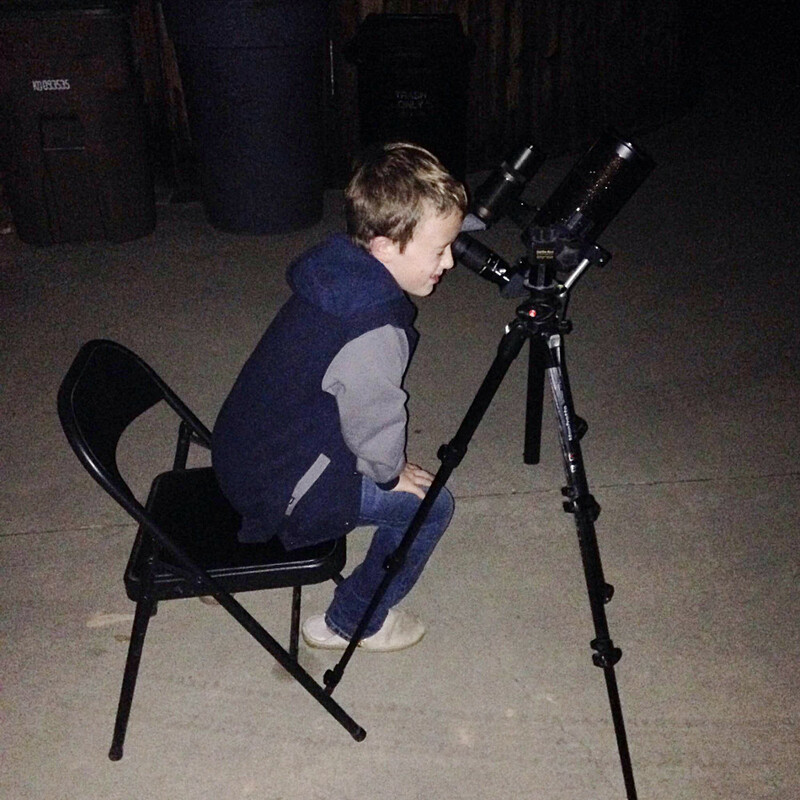 London has the telescope bug and he has a birthday coming up, so we were looking at various scopes on Amazon and other places. He wasn’t clear on the distinction between the three main telescope designs, so we hauled out the DK Universe book and looked at the ray diagrams the three kinds (refracting, reflecting, and catadioptric). He was familiar with refractors, like his 60mm Meade, and reflectors, like his Astroscan, but was less familiar with catadioptric scopes, which is not super-surprising since I’ve used my Maks hardly at all in the last year and a half, other than last year’s All-Arizona Star Party. 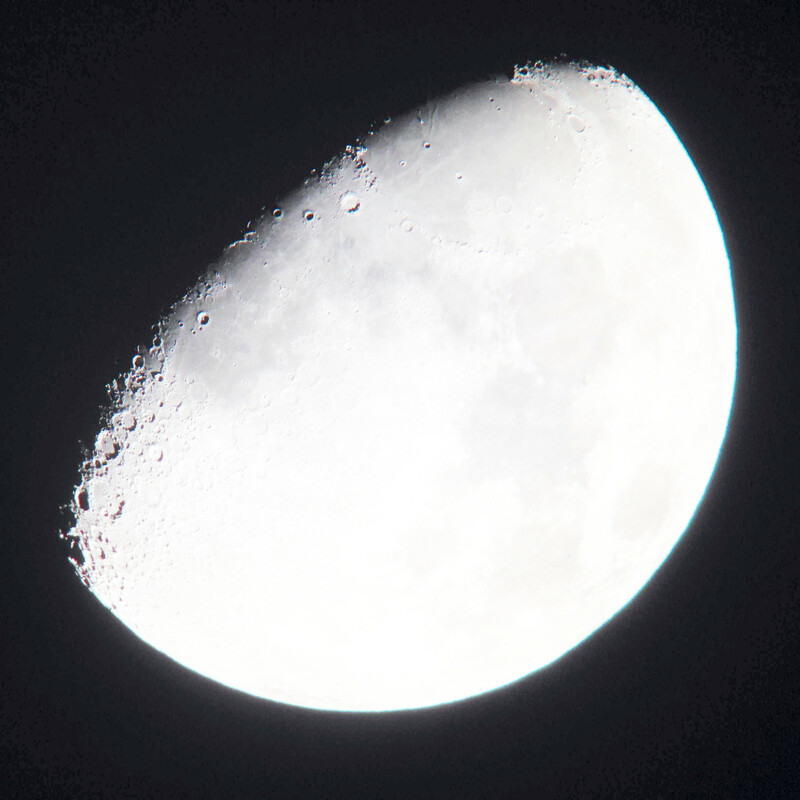 The sky was clear and the moon was high, so we popped outside and set up my 90mm SkyWatcher Mak for a quick look at the moon. Astonishingly, I had not had this scope out in more than two years, since July of 2012. Here’s my best iPhone photo of the moon from last night. Up near the top of the terminator you can see two glowing dots like eyes peering over the limb of the moon. If you click through to the full-size version, you’ll see that the eyes have a wide mouth below them and that one nostril is showing. Yep, that’s the lunar “Cheshire Cat”, which I first identified back in November, 2010. It was nice to see it again. I was shooting through the Celestron 8-24mm zoom, just like Saturday night. Since I had a comparable shot with the same eyepiece through the C80ED from that evening, I dug out the raw photo and tried brightening it up to see how much glare would appear. The answer is “almost none”. 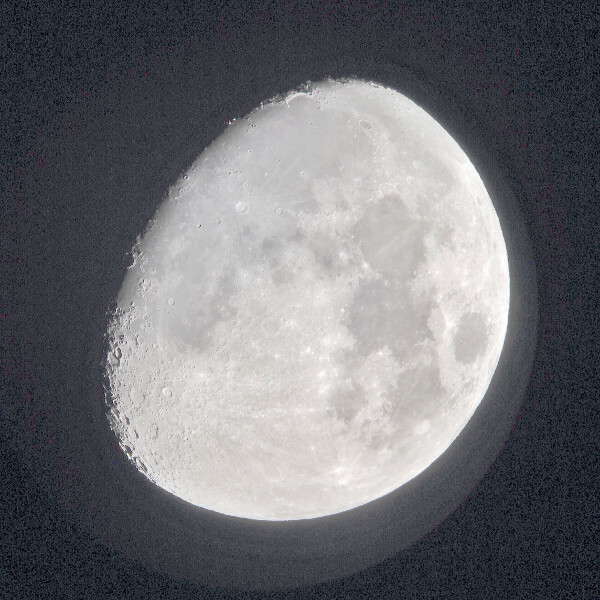 I used the same tool in GIMP (‘Curves’), and I brightened the image way beyond what I did with last night’s shot through the Mak, and the space around the moon is still pretty black in the C80ED shot. Not grey, as in the Mak shot. And this was only with tweaking the brights up, and not moving the darks down, which would be cheating since it would mask the problem. It’s tempting to read this as a refractor-vs-Mak thing, but it might not be so straightforward. In this case the refractor has very good optics and coatings, so it’s near the upper end of what refractors are capable of in terms of control of stray light. But the Mak does not have fully multi-coated optics–this SkyWatcher version only has ‘coated’ optics, which means possibly as little as one coat of MgF2 on only the outer surface of the corrector. I have heard from someone (Doug or Terry, maybe?) that this particular model of SkyWatcher 90mm Mak has poorer contrast than the comparable but fully multi-coated Celestron C90–irritatingly I cannot find that post or comment at the moment, but I’ll post it if it turns up. Also, the C80ED has a long-ish dew shield which helps control stray light entering the objective, whereas the Mak does not; you can buy or fashion such things for Maks, but I haven’t taken either of those steps. Finally, I’ve seen some threads on CN about glare from the baffle tube in Maks and SCTs, so that’s another possible culprit here. An informative test would be to pit the C102 against the Apex 127 on the moon, with a homemade foam or cardboard dew shield on the Apex to eliminate that variable. If I get time this evening or next, I may just try that. You are currently browsing the 10 Minute Astronomy blog archives for the day Monday, November 3rd, 2014.